Thanks to a controlled process of nanotechnology, Nanotop treatment, Serge Ferrari proposes to limit the maintenance products needed and to conserve the aesthetic quality of your equipment in weather. This infinitely small and invisible barrier impedes condensation or pollutants from staying on the surface of the fabric. your boat and marine equipment. 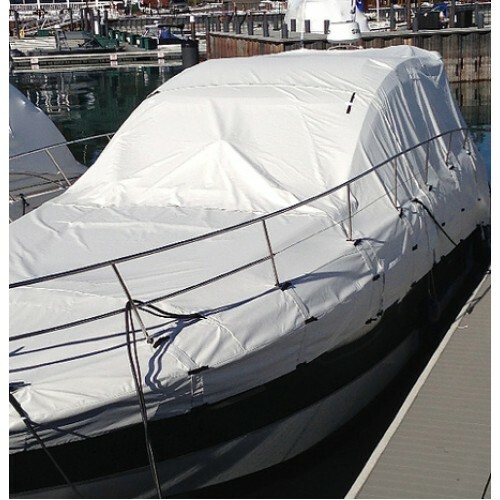 Stamoid fabrics are renowned across the marine industry as the toughest and most reliable under all conditions. 100% water proof and resistant to ultra-violet degradation, dirt, mould and mildew. Stamoid Marine fabrics are simple to maintain and offer a longer, hassle-free life of versatile use on the water. Available in 3 shades to suit the colour scheme of any boat, Stamoid Heavy is the perfect choice for protective covers with less reinforcements.